Holley Gerth (website), 2014, Revell. 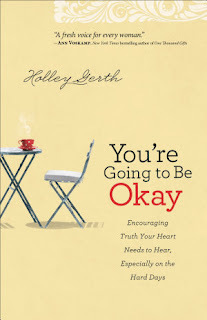 You're Going to Be Okay, by Holley Gerth, is about walking through hard circumstances, and learning to walk through them with the knowledge and assurance that you are going to be okay. It's specifically aimed at women, and offers wisdom and advise - including strategies to overcome the mental and emotional issues that come up during those times. I was in the middle of going through some things that were really beating me up a couple of years ago, when a post about it from one of my former World Race squad coaches showed up in my Facebook feed. My attention shifted pretty quickly from the book to other things, though, and it's only now that I'm truly out of that situation and able to take a deep breath that I've been able to really dig into this. I think I gave my opinion away with the opening line. Gerth's writing game is strong, and the overall tone is loving and encouraging. She is able to keep that tone going throughout book, even with some of the tougher issues she digs into. I know there are some circumstances where we will not listen to uncomfortable truths until we are smacked in the head with them, but that is not always the way we need to hear them. 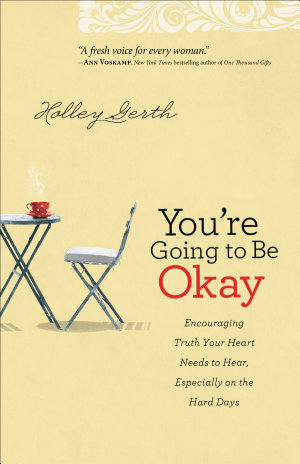 Gerth is able to address issues with grace and gentleness, but makes it clear that they need to be dealt with. Life hits us all with curve balls at one point or another. Sometimes the hits land in places that knock us down and leave us wondering if we're going to be all right. And sometimes, sometimes what we need to hear during those times is that we are going to be okay.